Turn up the oven and pull out the sheet pan. 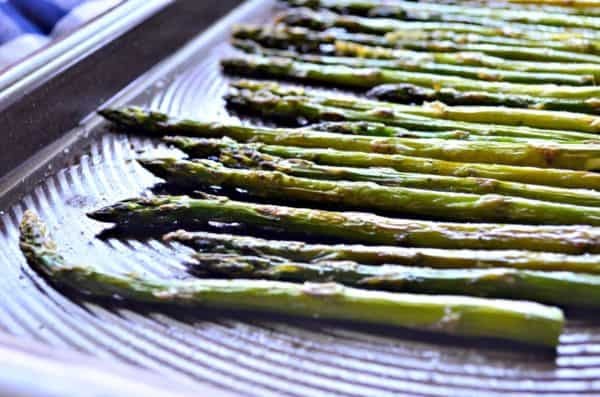 I’m here to share with you my no fail recipe for oven-roasted asparagus. You’ll have a healthy and delicious side on the table within 20 minutes. I’m happy to finally share a simple method to cooking a gourmet veggie. Lucky for us asparagus is available year-round, but spring is the best season for this nutritious green vegetable. For the past few years, I’ve become a huge fan of roasting vegetables. I’m finding it’s easier and less fuss to dump veggies on a baking sheet, drizzle olive oil on top and add on the salt and pepper. Mix well and place in the oven for a few minutes. The vegetables come out crispy and full of flavor. I like them better oven-roasted then I do steamed at this point in my life. Since the weather is finally starting to get cooler (of course, I live in Florida so I say cooler I mean it’s in the 70’s and 80’s here). That means I can finally turn on the oven without sweating to death in the kitchen. I’m happy to introduce you to my number one weekly side dish on my dinner table; Oven-Roasted Asparagus. Over the course of the next few months, I’ll be sharing some of my other oven-roasted vegetable recipes that my family and I are enjoying. But for today we are starting with the basics; oven-roasted asparagus. This is the easiest recipe and although I hesitated to want to share this recipe I felt that I needed to still share my favorite method to cooking asparagus. I know that I have to have a reader out their in a dinner rut and looking for new ways to prepare veggies. Maybe you haven’t thought about oven-roasting? Maybe you’ve been a steamer like me (for yearsss). The process to oven roasting asparagus starts with cranking up the oven to a high heat. I like to roast between 400-450 degrees Fahrenheit. While the oven preheats I give the asparagus a rinse and then lop off the tough ends (that were in the ground). 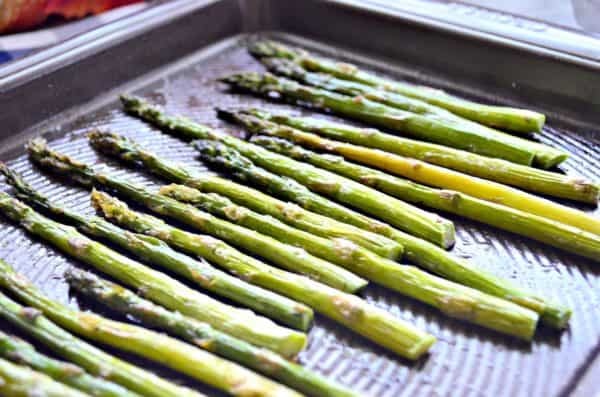 Place the asparagus on the baking sheet then drizzle with a good quality olive oil. You want to make sure that the prized asparagus tips have some olive oil on them so they don’t dry out. Then sprinkle the asparagus with salt and black pepper. If I’m feeling crazy I will even sprinkle with a little garlic powder. Just depends on the mood I’m in. Mix the asparagus spears with your hands until every spear is covered with olive oil. Then, inside the oven they go for 15-20 minutes (depending on the heat you set the asparagus at and your oven–every oven varies a little bit). I like to keep them in until they are still green but just a tad crispy. Trust me, nothing is worse then an overcooked oven-roasted asparagus spear. It’s better to take them out to early then late. Once you have oven-roasted a few times you won’t even need to come back to this recipe. You’ll be a pro! Oven-roasted asparagus is an easy side dish to enhance any meal. I also like to entertain with room-temperature oven-roasted asparagus on an antipasti board. You can roast it a day before hand, refrigerate the cooked, then pull out the cooked asparagus once your read to put together your platter! 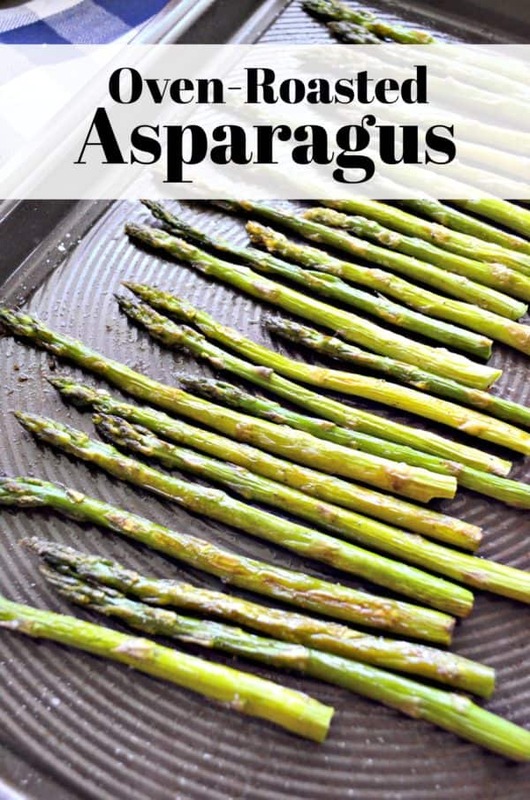 If your looking to switch up your side dishes and have never thought about roasting asparagus. I highly suggest you give it a try the next time you want to cook asparagus. Preheat the oven to 425 degrees Fahrenheit. While oven preheats, cut the ends of the asparagus off and wash under cold water. Pat dry with a towel, and place on a rimmed baking sheet. Drizzle olive oil over the asparagus. Then sprinkle the salt, black pepper, and garlic powder on top. Using your hands, rub the olive oil and seasonings all over each asparagus spear -- making sure every spear is coated. Place in the oven for 12-15 minutes (depending on the thickness of the spear and how well you want the asparagus cooked). Remove from the oven, and enjoy immediately. Or let cool, and store in the refrigerator for later use. Disclaimer: There are affiliate links in this post. That means, if you click and purchase from these links I will receive a small purchase at no additional cost to you. Thank you for supporting Katie’s Cucina!